"The seas" of the Divine Will to which Luisa refers in her writings are not yet known. God has his own time and He alone knows when His Kingdom will reach its fulfillment. We need to pray that this happens, spreading those that are our knowledges, after "studying" to be faithful to the message left by the Servant of God in communion with the Church. With Luisa at our side we are sure to take the right steps. Her mission, in addition to that of "victim soul", is to bring to everyone the gift of the Divine Will that God made her to experience at first hand to testimony "living as a son and not as a servant." Now, it’s time that also others receive this Gift! Already in October 2005, at the conclusion of the Diocesan inquiry, our Archbishop Mons. Giovanni Battista Pichierri had "felt the need to elaborate a biographical sketch of the Mystic from Corato, which has been achieved in 2014 with the first official publication of the biography "The Sun of my Will" by Prof. Maria Rosaria Del Genio (LEV). Through a conscientious work of research and study Prof.Del Genio, an expert on mystique and the lives of saints, gave birth to the above - mentioned volume, a valuable "document" offering, anyone reads it, the opportunity to know the life and therefore the spirituality of Luisa Piccarreta, so that "the message of the Divine Will may radiate throughout the world ... fiat voluntas tua sicut in caelo et in terra, as claimed by Mons. Pichierri in his afterword to the text. He himself wanted to share this “extraordinary message " with the bishops from Puglia and the prelates interested in the Cause for beatification of the little daughter of the Divine Will, gifting them with the book. Many responses and opinions about it came to Mons. Pichierri that he faithfully turned to the Association Little Children of the Divine Will. "Thank you for the gift that I really appreciated ... I read with attention and spiritual utility the biography of Piccarreta ... This beautiful book shows the extraordinary figure of “The Saint from Corato "... example of a life dedicated to the love of Christ in a state, at the same time, of mystical tension and suffering. The book also highlights the particular message and spirituality of the Servant of God on adherence to the Divine Will ... The great aspiration of us all is certainly attend the Beatification of the Servant of God ... we look forward to the conclusion of the work ... to know exactly the theological and mystical vision of Piccarreta. "(Card. Francesco Monterisi- CTV). 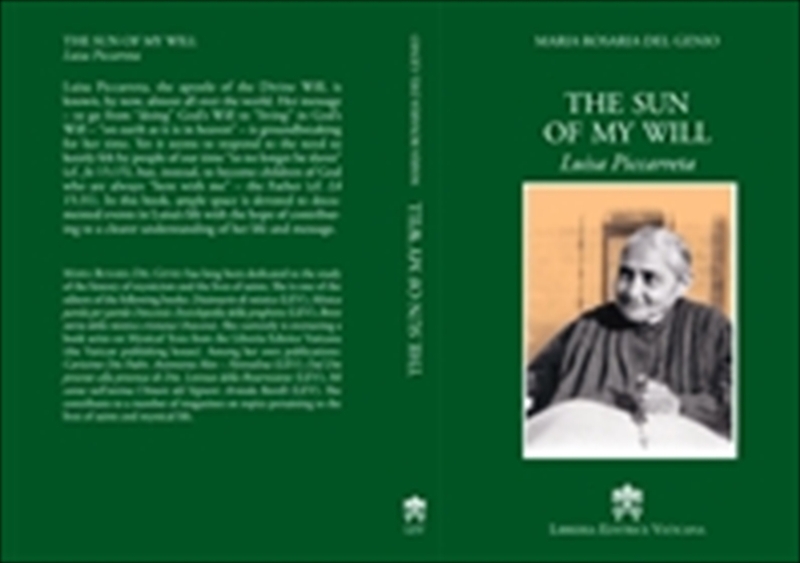 "I received the book on Luisa Piccarreta and I thank you wholeheartedly for this initiative, which has become indispensable to make this " little servant of the Divine Will. " fully known. It 's true that when the Good and the Truth come from God and reside in humble souls who are completely entrusted to the Church, they cannot remain immersed in darkness... Providence has its way... I remember when with Mons. Cassati we went to the Congregation for the Cause of Saints ... now finding myself in front of a book written by a respected author and researcher, published by Libreria Editrice Vaticana was a surprise that filled me with joy. "(Msgr. Michele Seccia-Bishop Teramo-Atri). "Sending you my regards, I leave you all in the immense sea of the Divine Will" .